We’ve made a good start – let’s continue bravely following handouts, screwing up, and fighting our way through momentary problems. This week I’ll have a chance to sit down with everyone and help out more. 4. Make online exercises that can just as easily be printed, even if not done online. Spiffy appearance! d. Try out Hot Potatoes to create online / printable exercises – match, word order mix, crosswords, cloze, fill-ins, etc. a. Edit using Word – add links, descriptions of the sites, directions, etc. - I tell them – play a few games, do an exercise, play some more, do a few exercises, etc. and they do! a. My most well-meaning tip is to tell you: don’t bother! c. Images and Image collections – see the Images section on our website. Consider copyright! When you Insert – Picture in index.htm using Word, it automatically converts the file names and places them in a separate folder mirroring the filename: index_files. If you make a second webpage called food.htm and add an image, then Word will create a folder called food_files and will place the images in that folder and rename them image1.jpg, image2.jpg, etc. regardless of their original names. c. It should work – don’t try this after enjoying a few good German beers or you might have problems. Trust me. If you know of a better way to do this, please feel free to tell me – I’m all ears. Anytime you use basic programs and free webspace, you must reckon with certain problems and idiosyncracies. If you’d like to pay money for your website, then you’ll have fewer problems and more support. View the resources at the Website section of our Immersion Website or I’d be happy to show you how to do this for a substantial fee, if you’d prefer. Know what I mean? 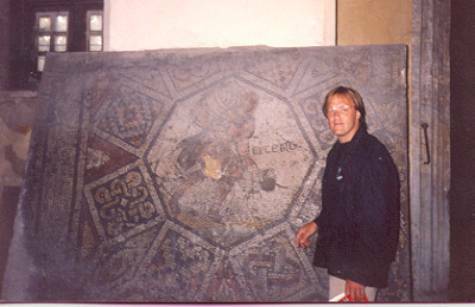 Young Bob admiring one of the few remaining mosaics at Hagia Sophia in Istanbul, 1992.